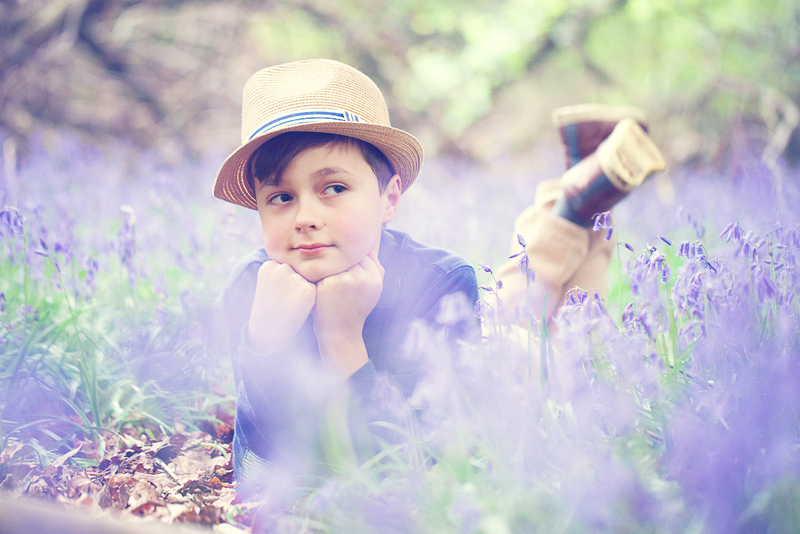 Bluebells in bloom is one of my favourite settings for children’s portraits. Typically bluebells only stay in flower for 14 days. So, this year I really wanted to make the most of those days. I wanted to give parents photographs of their children that captured a special moment in the floral calendar. The difficulty is never quite knowing when the bluebells will appear. The strange weather conditions we have had recently didn’t help at all. Moving from sun to snow, to wind and back to snow again, followed by rain. So it was difficult to predict what might happen. You can’t imagine my excitement when I spotted a handful of bluebells in someones garden. I drove directly to my bluebell setting to see if they had arrived. I am so pleased that there were parents and children as keen as me. Everyone who got in touch changed their plans to book in a session. I have met so many lovely children and their parents during the bluebell season. I’ve started editing and look forward to choosing my favourites. Choosing just one from Thomas’s session was very difficult, Thomas was an absolute delight to photograph. Thomas loved having his photo taken and together we wandered through the forest, climbing, sitting, talking and taking photographs as we went. He would often suggest ideas for photos and informed me that in the past he had some modelling experience. He was such an easy going boy, as always I aim for my sessions to be very relaxed. Thomas could have easily carried on going wandering after the sun went down. If you would like to next added to next year’s bluebell portrait list, please click here. Also if you’d like to know more about booking a family or child portrait session with mimivp photography, then please don’t hesitate to get in touch, on 07540 090 242 or via the contact form here.